Imagine your ideal clients or customers are looking for something you offer. They start by searching suppliers or providers in their area and suddenly they’re faced with a long list of companies. Which is the reason why you should define your USP. Have a closer look: How does your small business you stand out amongst your competition? Are you making it easy for your ideal clients or customers to find you? Do you give them a reason to choose you over the others? 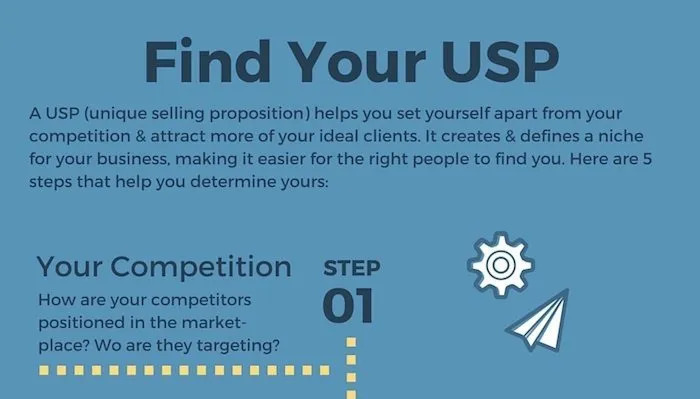 The best way to attract your target audience is to define a USP (unique selling proposition) for your small business and make it the heart of your marketing strategy. Consumers and businesses are inundated with choice these days. This has its perks but makes it a daunting task to find what’s right for you. All the more important to have a clear and straightforward marketing message for your small business. A well-defined USP lets your audience know what to expect when doing business with you, shows them what you stand for and makes a compelling case why they should choose you. With your USP, you can translate values into a memorable slogan or tagline for your small business (think “Every little helps” or “Just do it”). This way you make it really easy to find the right tone of voice and design for your marketing material. And there are just 5 steps to get you there! Check out these great examples of USPs. What’s a USP, Why Do I Need One & How Do I Get One? Small Business Brand: What Is It, Why Do I Need One & How Do I Get One?